Kentmere Pike forms part of the ridge between the upper reaches of Kentmere and Longsleddale. It is part of a block of high ground that peaks at Harter Fell. Harter Fell curves around the top of the valley of Wren Gill, with a short ridge that ends at Little Harter Fell and a longer ridge that runs across Kentmere Pike and on to Goat Scar and Shipman Knotts. After that the ground drops rapidly towards a pass that links Sadgill in Longsleddale and the outskirts of Kentmere village. The ridge bulges slightly at Kentmere Pike, and then generally narrows and drops on its way to Shipman Knotts - Goat Scar and Shipman Knotts can both be seen as part of Kentmere Pike, although we will treat Shipman Knotts as a separate fell, partly because it sits beyond a bend in the ridge and partly because of its position at the top of a steep climb. As with many Lakeland fells the two sides are different - the western slopes are steep but even, while the eastern slopes end in a jumble of crags that overlook the River Sprint. Generally mountains only take the name of a valley if they sit at the very top, but that isn't the case here. The Kentmere valley continues on for several miles past Kentmere Pike, heading towards Thornthwaite Crag. However Kentmere Pike is the last fell seen from Kentmere village, with the upper reaches of the valley hidden around a corner in the valley. Kentmere Pike is a good example of a fell with better views out of the Lake District than within it - it does offer good views of the fells around Kentmere, but the high ground beyond is largely hidden from view. The better views are east to the Pennines or south out to sea. 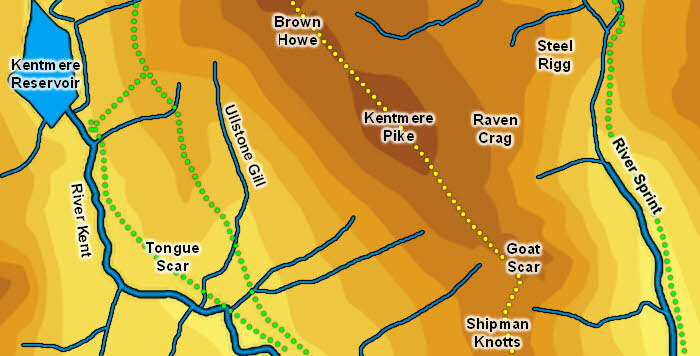 The main routes onto Kentmere Pike are either along the ridge from Shipman Knotts or down form Harter Fell. There is also a more direct path that comes up from Hallow Bank and Brockstones in Kentmere to join the main path south-east of the summit. The summit can also be reached up the north-eastern slopes from Steel Rigg. We visit Kentmere Pike during the Kentmere Round. The summit is a gentle grassy mount, topped by a stone wall that runs along the top of the ridge (running all the way from Harter Fell, over Kentmere Pike and down Shipman Knotts). A huge number of streams are born on the flanks of Kentmere Pike, although none seem to have been awarded with names. The eastern boundary is formed by the upper reaches of the River Sprint, and the western boundary by Ullstone Gill and then the River Kent. Kentmere Pike has no named tarns.